Teen Vogue wins the April Sidney for its agenda-setting social justice coverage. While long-known for lifestyle stories on fashion and trends for young people, Teen Vogue now also brings them up-to-date on the latest fight for gender, social and economic justice. The brand has undergone a social justice reinvention over the past few years, garnering much attention for the website’s December 2016 piece “Donald Trump Is Gaslighting America” by Lauren Duca. In January 2018, chief content officer Phillip Picardi welcomed journalist Samhita Mukhopadhyay–who shared a Hillman Prize in 2011–as executive editor, with the goal of further deepening Teen Vogue’s political coverage and amplifying the voices of young activists. Most recently, Teen Vogue has been at the epicenter of the national debate on gun control that followed the mass shooting at Marjory Stoneman Douglas High School. The outlet dedicated its March cover to the new faces of the gun control movement. Teen Vogue’s outspoken coverage has put it in the crosshairs of the NRA and the so-called Alt Right. Their historic digital cover video showed gun control activist Emma Gonzales ripping up a shooting target, but hostile elements digitally altered it to make it look like she was ripping up the Constitution. Their social justice coverage extends to labor issues. They recently published a piece called “What a Labor Union is and How it Works” by Kim Kelly that brings the next generation of workers up-to-speed on organized labor, teachers’ strikes and the pivotal Janus v. AFSCME case now before the U.S. Supreme Court. 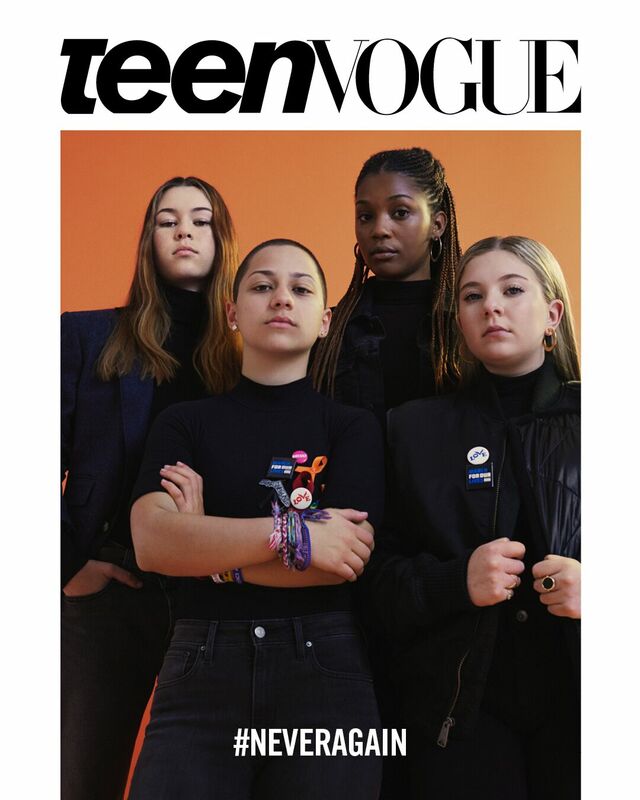 “Teen Vogue’s political coverage is energizing, educating and entertaining a new generation,” said Sidney judge Lindsay Beyerstein. “They’re giving young readers the tools they need to change the world for the better. Q: How did a glossy like Teen Vogue become a leading purveyor of social justice reporting for young readers? A: When he came on as digital editorial director a few years ago, Phillip Picardi (now Teen Vogue’s chief content officer) recognized that young people were interested in more than fashion. While that was–and still is–important to them, they were also invested in politics and social justice, so Teen Vogue started including more of that type of coverage. Our readers responded to it, and now expect to see that type of coverage daily. Young people are more aware, engaged and motivated than they’re often given credit for, and it’s really important that they are not underestimated. Ultimately, we want to give young people the tools, information and resources they need to bring the changes they want to see in the world. Q: You’re just starting your tenure as Executive Editor. What’s your vision? A: My vision for the newsroom is to build on the momentum and brand-awareness Teen Vogue currently has by delivering impact-driven, timely and relevant analysis and reporting around the issues our readers care about, specifically social justice and politics, identity, and pop culture. Q: What’s the secret to getting young people interested in political journalism? A: The same thing that that gets anybody interested in political journalism: equipping them with the information they can apply to their day-to-day lives, their personal relationships and experiences, conversations, and their political interests. The quest for authenticity is very deep in this generation. Young people don’t often see themselves represented in the media; so while other outlets may talk down to them, we aim to empower them to tell their stories, to share their experiences; to be a place for young people to be able to explore and express their identities. Q: How did Teen Vogue become a hub for Parkland coverage? A: When the shooting happened, Phill [Picardi] and I both knew this would be one of the most, if not the most, important news story for Teen Vogue this year. With the leadership of our politics and news editor, Alli Maloney, we put a line out to Parkland students to ensure their voice was heard. We knew the issue of gun violence was one that our readers cared a lot about, so we were committed to covering every aspect of the story as it unfolded from the news, to the broader issues (mental health, gun control, teen intimate partner violence), to the movement that grew out of it. We also wanted to do something impactful and visual onsite the day before the March For Our Lives, so we dedicated a digital cover package to the new face of the gun control movement, which featured nine young activists from all over the country–Parkland, Ferguson, Wyoming, Newtown­, Chicago–sharing their experiences as they worked for change. Q: Do you have plans to do more labor journalism in the months ahead? A: Yes. Young people are very stressed out about the economy and interested in what it looks like to fight for labor rights. While union membership is on the decline, I think new systems are emerging where young people want to hold larger companies–or even systems–accountable. The two things that used to be the key to the American dream–a college degree and home ownership–both lead to debt or are not even possible anymore. Beyond that, our editors and I are really interested in unfair labor practices and specifically how they impact young people. Q: How has Teen Vogue’s coverage changed in the Trump era? A: This is a crucial time in our country’s history, and so many of the issues going on in the world—race, identity, mental health, violence—directly affect young people. Teen Vogue’s content is always tailored through a lens that explores how our young readers are impacted and helps start a dialogue about them. It would be tone deaf to ignore the sea change that is happening in the world of entertainment around the #MeToo movement or not address the lack of diversity in fashion. Outside of doubling down on our political coverage, we are also committed to analyzing most of our content through the lens of “why now” and “why should you care.” Our readers care about the world around them and through our content, we have the opportunity to provide information and resources that will help them change the world for the better. Samhita Mukhopadhyay is Executive Editor of Teen Vogue. An accomplished writer, editor and speaker, Samhita formerly served as Senior Editorial Director of Culture and Identities at Mic and is the former Executive Editor of Feministing.com. She is the co-editor of Nasty Women: Feminism, Resistance and Revolution in Trump’s America the author of Outdated: Why Dating is Ruining Your Love Life. Her work has appeared in Al Jazeera, The Guardian, New York, Medium, Talking Points Memo, Mic and Jezebel.